LP0331. 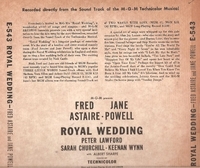 ROYAL WEDDING, Original 1951 M-G-M Soundtrack, w.Fred Astaire, Jane Powell. (10” LP)10" M-G-M E-543.